Helena wrote a thoughtful comment a couple posts back, about how reading this blog helps her pay closer attention to her home in the Sussex countryside. On the surface, we live on different continents, with different climates, terrain, and native inhabitants. But not too far under that surface, what we have in common is an evolving feeling of home. Curiosity and a willingness to be pulled deeper into the familiar, only to find that it is wilder, more astonishing and wonderful than we can imagine. I’m a slow thinker. Wandering from one task to another in the garden this afternoon, I followed my thoughts as they looped and spiralled around this theme of home and how we pay attention. My hands dug in the soil, feeling the warmth of the sun caught there. I felt the hard pellets of sweet pea seeds as I pushed them in to just the right depth. My fingers scrabbled dandelion seedlings out of the compost around the rosebushes, and wiggled the long taproots of established dandelions until they released their grip. 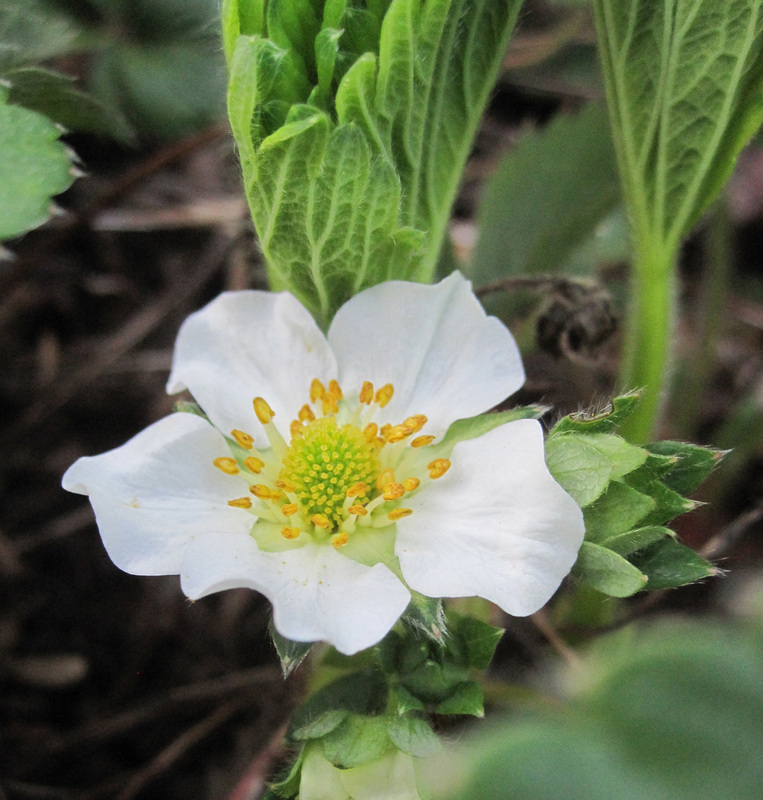 I felt the tenderness of strawberry leaves as they unfold, and found the tight form of the berry-to-be in the flower. When I squatted down by the beehive, they ignored me as they landed on the bottom board. Their back legs were loaded with pollen and they went directly into the hive. All of us went about our tasks of gathering, tending, growing. I can’t say that I was thinking in words or noticing the passage of time, but still there was rumination and consideration happening. Slowly. As I sit here writing now, I am aware of wanting to pull together threads into elegant connections: how we pay attention, how neuroscience and some forms of spirituality overlap; this notion of “home” that comes up for me again and again in my life; and just this evening listening to a radio program about Henry David Thoreau and his relevance today, 150 years after his death. I have not borrowed my neighbor’s ax in order to build a small cabin next to a pond in the woods. But I do live in a small house. There was a time when I lived in a bigger house and had more things. Then, it mattered to me that my silverware matched, and that the curtains were right for the house. These days my silverware is a jumble of hand-me-downs and thrift shop finds, and I couldn’t be happier. I have had the privilege of living out of a backpack and noticing what I really need to live. Truly, I don’t need that much stuff. Food, warmth, shelter. The intangibles feel like riches–friends, relatives, companions. Being upright and breathing and able to walk around with senses fully alive. Paying attention, exercising curiosity. Today it occurred to me to count all the books in the house. I stopped at 158. There are lots more here, maybe 300. One of them is a collection of Thoreau’s writing. I’ve read him before, and always lost patience with his nineteenth century deliberateness and New England sensibilities. I have a notion to try again, because he was a writer who understood home and attention. He grew where he was planted. As Helena is doing in Sussex, and as I am doing here. As the bees and strawberries do with no effort at all.